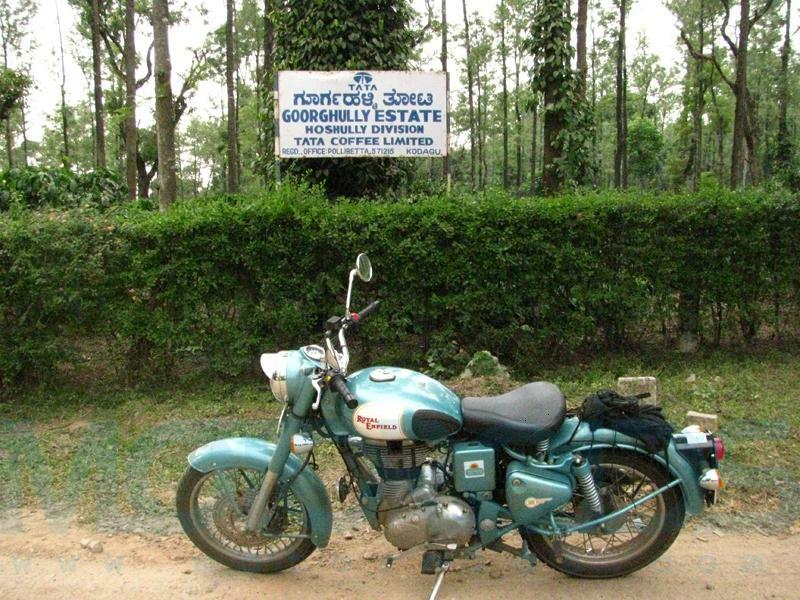 After the success of the Himalayan Odyssey tours in the north, Royal Enfield took up another experimental endeavour in the form of the Southern Odyssey, exploring the southern part of the country in the most exciting manner, on 2 wheels astride a Royal Enfield Bullet. I got the chance to be part of this tour and test my riding skills on the newly launched RE Classic 500. Day 1 started off with each rider being given the Southern Odyssey Tee with the odyssey war cry printed across the back “Ready Steady Po!” (PO being the Tamil equivalent of GO!) All were also allotted a number which would serve as identification all through this adventure. 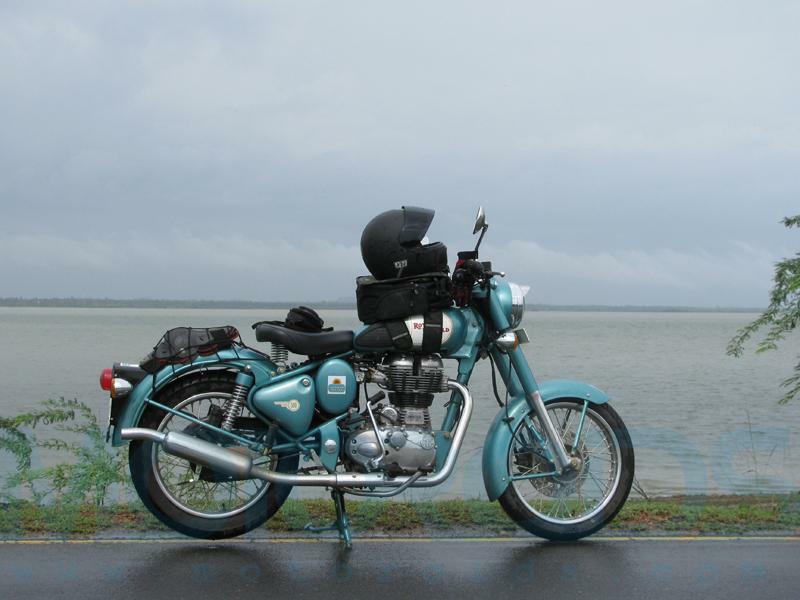 I was allotted a Sparkling Aquamarine blue RE Bullet Classic EFI 500, TN 03 C 5652; with 1640 Kms on the odometer and she would be my partner for the next 2 weeks on this Trans South India extravaganza. 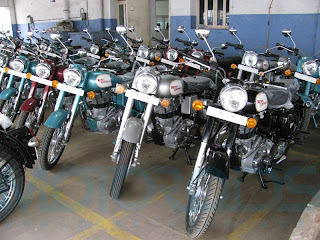 The first day was purely “boot camp” day where the riders were given a brief idea about what this adventure was going to be like and then were taken to the Madras Motorsports Club race track and given a chance to ride the bikes all around the circuit and were taught basic motorcycle control techniques. Besides giving us the experience of freewheeling on an open track we were educated on the importance of correct braking, throttle control, proper acceleration and negotiating curves. What helped the novices acquire riding skills helped the seasoned rider revisit the lessons he had learnt. The 2nd half of the day was spent at the Royal Enfield factory where we saw how each RE Bullet is immaculately assembled by hand on their assembly line. The most interesting aspect of the bullet was the gold pin striping on the tank and other parts which is painstakingly done by ‘Hand’ even today by 2 expert automotive paint artists specialised in this art for over 15 years. Despite being a retro styled motorcycle, the new RE models are manufactured using modern day technology to facilitate better riding comfort and better performance from the motorcycle. The next generation engines were being tested for leakages and NVH levels extensively including a post-assembly / pre-delivery overall motorcycle performance test on a dyno, hinting at a probable increase in overall motorcycle quality from Royal Enfield in the years to come. The sight of the parking bay brimming with shining metal and chrome monsters made the day for most of us who love the bullet purely for its looks and intimidating presence. The day ended on a nice note with each individual participant getting to know each other and all the motorcycles arriving into the Chennai hotel and getting prepared for the ride of a lifetime. Day 2 started with an early morning breakfast-briefing and moving to the Royal Enfield brand store where the Ride was officially flagged off by Siddharth Lal, CEO of Royal Enfield. The flag off was set to the backdrop of Trans music which hardly got noticed due to the din and roar of 20 odd Bullets. 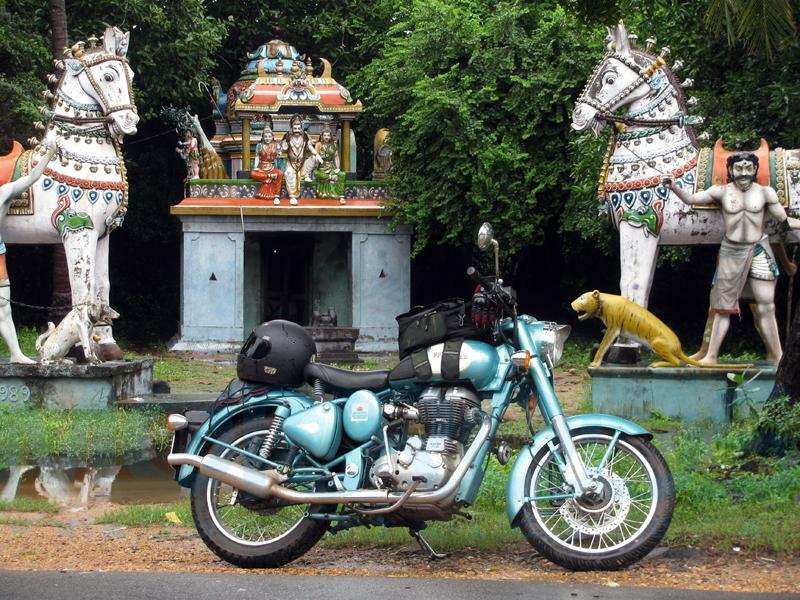 The group of riders was escorted by few bulleteers from Chennai till the outskirts and on to the East Coast Road leading to Pondicherry. 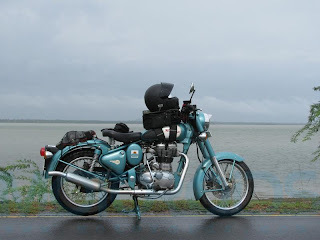 The ride theme changed to Ready Steady POUR as we were hit by the cyclonic thundershowers the moment we hit the ECR and got drenched in the first few kilometres. The ECR is an awesome stretch of tarmac, stretching from Chennai all the way alongside the coast to Pondicherry lined with the sea and coves on one side and old medieval temples and villages on the other. The roads were lined with colourful village deities and south Indian artefacts carved in stone. By the time we crossed Mahabalipuram the rains became blinding reducing our pace to a miserable crawl. Lunchtime saw us entering flooded streets of Pondicherry as we rode through knee deep water at the famous promenade and reached La Café, a hot and happening coffee joint famous for its 24 X 7 exotic coffees. The sleepy town woke up to the thundering machines as we rode, people braving the showers to take a glimpse the juggernauts.It was here that we came to know of the first casualty of the ride. Kanwardeep, affectionately called KD the chief co-ordinator of the ride got nudged by a car coming from the opposite side and fractured his pinky finger. He managed to also amaze the doctor treating him by asking whether he could wear his glove over the bandage and continue the ride. I guess the Doctor muttered something like “Bikers! Mad Chaps!”, in his strange dialect as he fumed out of the room. Well I guess that’s what the breed of motorcyclists is famous for; not getting bogged down by any adversity and living to ride. Somehow everyone managed to coax him into taking shelter in the support vehicle and continue the rest of the journey inside the backup car. After Pondicherry we moved further south along the coast till Karaikal. The rains were getting worse by each passing moment as we struggled to see the road ahead through half closed eyes and half opened visors. Finally after reaching the hotel each of us squeezed litres of water from our soaked clothes and snuggled up for a warm experience sharing session over few glasses of throat warmers. The third day started early in the morning with inspecting the bike after their night out in the rains. Weather gods were slightly in favour of the riders and the downpour had reduced to a moderate drizzle making the weather somewhat pleasant to ride. We took off from Karaikal towards Rameshwaram our next destination. After Nagapattinam, the legendary fishing town which got completely wiped out in the infamous tsunami that hit us few years back, we took a slight detour to visit the holy shrine of Velankanni. 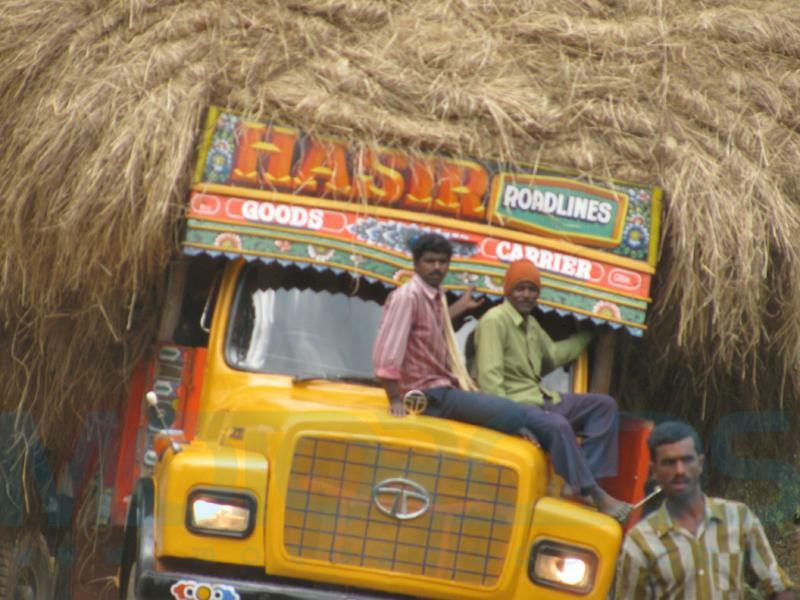 Getting around south India can sometimes be tricky as we experienced this day when we got lost in Nagapattinam town and kept asking for directions to hit the highway. Almost all the milestones are in the rural language leaving us with limited numeric information; so we knew something was 48 kms ahead but couldn’t figure out WHAT!!?? Rains kept troubling us as we rode down the coast almost touching the sea shores at places but couldn’t get enough opportunities to stop by and enjoy the scenery. This was one stretch where I could actually open the throttle of the bike enough to see how fast it could go without scaring the rider. I managed a good 140 KMPH indicated by the Speedometer and on the smooth tarmac the only force I experienced was the bike pulling away at hard acceleration as the 2 zappers tried to gobble as much tarmac as they could. The bike holds steady at a comfortable speed of 80 – 90 kmph but anything more than that and the vibes start getting communicated to each and every part of the body causing discomfort and pain. On the highway at these kinds of comfortable cruising speeds, I managed to extract a good 32.6 Kms for each litre of petrol that I had filled in. Finally late afternoon we reached the outskirts of Rameshwaram and saw the huge Indira Gandhi Setu, or Pamban Bridge that connects Rameshwaram to the mainland. This bridge gave us a spectacular view of the horizon. This was one of the few places in India where sunrise as well as sunset happens over the sea. Time constraints prohibited all of us to go further on to dhanushkodi but a few of the fast riders did manage to get a glimpse in time. After spending a good more than an hour at the massive bridge we rode into the bustling Rameshwaram town and ended the day with a quick inspection to all bikes which required attention. Some guys did manage to go to the temple while most of us just relaxed and recovered from the fatigue of having ridden in the rain as such. The fourth day saw us move from Rameshwaram towards Kanyakumari. The day started off peacefully as we fuelled up and moved towards Ramnathpuram and then got off the main highway towards Ervadi. It was here that suddenly we were stopped by the Tamil Nadu police and rounded up for questioning. Wondering why we had been rounded up although all of us were wearing helmets and obeying all the traffic rules, while everyone else in the village was wearing lungis, slippers and riding 3 + on the bikes; the reality soon came to light when the Police Inspector clarified that the Hotel owner at Rameshwaram had filed a police complaint over some non payment of dues and had reported a gang of 20 odd bulleteers as the offenders. Well, that definitely made us proud for a minute thinking at least he remembered the riders rather than the organisers of the ride, but then it also amazed us about the immense power of an influential network in a state run by references and ‘jacks’ as we call it. So once the cheque was given off and dues settled by the organisers we moved ahead towards Tuticorin, locally known as thootikodi. The road to Tuticorin probably was the most amazing tarmac surface we saw in Tamil Nadu and most of the bikers were cruising at a comfortable 80 Kmph plus as the weather too had cleared out. Tuticorin has been a port of great historical value as was evident by the number of old classic maritime building all over the place. Interestingly despite the hot and humid climate there the Church was called the Church of the Lady of Snow. Coming to think of it, where in the world would the locals at Tuticorin ever see snow? Roads between towns were decent irrespective of them being National Highways or State highways while inside the city it was an ever confusing network of one ways and roundabouts and friendly helpful people who kept pointing in diametrically opposite directions when you mention the tongue twisting name of your next destination. We passed through Uveri (YES! It’s pronounced THAT way only!) , and headed towards Kanyakumari on the road alongside the coastline dotted with small and beautiful village churches and scenic locations giving us ample opportunities to stop a while and admire the surroundings. After reaching Kanyakumari we ventured out to explore the southernmost tip of India. This is where we could see all the three different oceans surrounding India at one place; the Arabian Sea, the Bay of Bengal and the Indian Ocean, marked by a different colour of the water itself. Kanyakumari like any other religious destination was jam packed with people and hustling with activity. 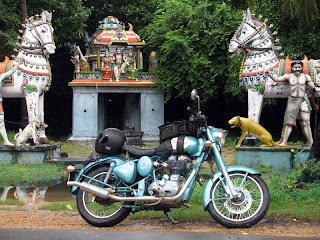 Day 5 saw us riding from Tamil Nadu into Kerala and up the west coast this time. Unluckily for us, the cyclonic thundershowers had also moved in from the east coast to the west and were kind of following us here too. Luckily we woke up to a clear sky and saw that the weather was good to ride. Taking off towards Nagarcoil we entered Kerala and instantly saw amazing roads. Looks like the government had spent significant amounts and got them surfaced. The change was welcome as I got a chance to whack open the throttle once again. We were joined by a French journalist couple also on this trip who would be penning their experience. After a brief stop at Neyyar Dam we halted at a small town called Nedumangnam, really difficult name to pronounce, for a quick lunch of Dosas, Parotas and Sambar. Asking the local people directions for such tongue-twister of a name was quite a difficult task for the folks who came from North India where names were relatively easier to pronounce. I guess that is one skill we must develop before we embark on a journey to discover south India. The group was still quite fresh in terms of Biker Lifestyle skills and parked the bikes in a really haphazard manner in front of the hotel. Each day we were given some tips on organized motorcycling and synchronised, aligned parking was the talk of the day. After Lunch the road continued getting better and better coaxing us to ride our bikes even harder and with the Kerala traffic actually being systematic and giving you the right of way for overtaking we made it to Kottarakara in hardly any time. It was here that we realised that the silencer on the French folks’ bike had fallen off somewhere on the way and since they were under the impression that the Bullet was a Loud bike they did not notice it or bother to check why the bike was creating a din. Quickly a spare one was pulled out and fitted back on the bike and we moved off. Riding in the sunny afternoon after a heavy lunch called for a quick refreshing tea and I stopped at a roadside joint for some. I realised that a conversation between 2 guys who do not understand each other’s language can sometimes be interesting. The chai guy and I managed to not only discuss the new Bullet but he also suggested i should eat one of his sweet appam which would energise me. Yes it definitely did the trick as I felt very fresh after the quick snack n tea. Entering Kottayam we knew that it was time to make a mad dash to the back waters of Kerala if we wanted to have any good photographs. So after quickly dumping our luggage, we zoomed off towards Kumarkom and landed up next to the canals and waterways just in time to see the sun slowly go down and houseboats float with cosy couple sitting on the deck cherishing their special moments watching the sun go down. The bullet made a pretty sight against the backdrop of the tranquil backwaters as the sun slid down into an orange luminous ball of fire and coloured the whole sky a beautiful tint of saffron. Looking at the shiny beautiful metal monster made my heart skip a few beats, guess I was falling in love all over again. The day started with mists and fog swirling around the Kerala backwaters as we got ready and rode off from Kottayam. The route was scenic and led us into the mountains now. It was time to bid adieu to smooth straights and start attacking the twisties of the ghats. The roads first snaked through foothills which were abundant with rubber trees each of them having a small plastic collector mechanism to collect the rubber sap dripping down. As we moved higher up, the tea estates started adorning the slopes of the hills with tufts of nicely trimmed and layered vegetation, and a small path cutting its way across through the thick brush. A small stop atop a hill at Vagamon earned us fresh tea made from the tea leaves produced locally at one of the farms and warm sunshine on our faces and body. The warm touch was welcome after the rains and mists and cold foggy weather we had been encountering so far. It was during this leg that we also reached the highest point in the southern hills of this region. It was a hill called Kalvari Mount which started off with a smooth paved road at the foot and ended up as treacherous gravel ridden steep inclines at the apex. Not everyone had the courage to take a heavy metal Monster up this slope. The valiant few who tried, did meet with some amount of success and pride of accomplishing the hill climb. There were casualties as the heavy bikes did topple and broke off rear view mirror stubs but then what’s great about having fun without any bruises. Once this off road exercise was done we realised that it was not just tarmac where the Bullet was at home but throw in a small off road patch or two, incline added and it could also tackle them with some effort. Out of the 5 Bullets which went up the hill 3 were Classic 500’s and despite having Zappers (good on tarmac, but relatively hopeless on gravel), they managed to scale the mountain. Descending from the mountains we rode back into civilization and into the small hamlet of Kumily which is next to the Thekkady camp which is the base location or the Periyar Wildlife sanctuary. After checking into the hotel we rode into Tiger-land and explored the sanctuary. Viewing the Periyar River with its half submerged trees was an amazing sight as evening set in with numerous birds chirping their way breaking the silence by their melodious sounds. As nightfall slowly crept in we parked the bikes and went into the forest once again on a night patrol trek this time on foot and managed to spot some deer, and wild hogs. We definitely did hope for a Tiger but then somehow the idea of being spotted by a tiger at dinnertime wasn’t one of the best ideas. It was a rather late night when we returned back to the hotel but the street was still bustling with truckers and small tea shacks and eateries still dishing out hot n steaming delicacies. Thekkady was our first encounter with forest roads which we immensely liked for their width, smooth maintained surface as well as the omnipresent green cover overhead. A straight road led us into Tamil Nadu from Kumily with lush green vegetation on both sides and mist laden mountains in the distance. Once we crossed Theni and had a quick brunch of a south Indian snack the subsequent 40 odd kilometres slowly made us climb the ghats once again. Tea estates were replaced by dense forests as we snaked up the hill. There were small seasonal waterfalls at the sides of the hill running onto the road at places resulting from the rains that had happened a few days back. We entered Kodaikanal through a toll collection gate and immediately came across the silver cascade waterfall. The tourist season was at its peak as was evident by the huge number of vehicles that poured into Kodaikanal and the crowds that had gathered around the waterfall making it pretty difficult to stop there for a quick picture. The sky was a cool azure blue with tufts of clouds colouring it white. The city was adorned with lights and decorations and an old church was located right next to the hotel we had checked into. This was the best accommodation we had got in the entire journey so far and we really loved the comfortable and snug place. Since we had reached the destination well before afternoon we hunted and found a nice Punjabi dhaba for lunch. Post lunch we strolled around shopping for home made chocolates and marshmallows; the delicacies Kodaikanal was famous for. Coming back from our short shopping trip we ventured into the town on our motorbikes. That night we had a campfire in the garden of the resort and extended an invitation to all the other people staying at the resort. It was a fun filled evening with each of us coming out with our musical and storytelling talents and amusing the audience. The british couple sang an English Christmas song, the couple from Toulouse had a French melody for us, while some of us tried our hands at english, dogri, punjabi and south Indian songs along with an impromptu version of the famous camp-fire song surangini composed and created by Srinivasan, one of the most enthusiastic bikers I have seen. The grand finale was a mad head-banging session to loud music and everyone letting their hair down and dancing in frenzy. A late dinner and we all slowly dragged ourselves back to the cosy comfortable beds and dozed off. The day was very overcast as we rose, We quickly had our breakfast and set off on the next part of the journey. Rains were getting thicker but the cold was still not affecting our biking spirits as we moved out braving the drizzles. Fog had started getting thicker and visibility was dropping down drastically. Our speeds were reducing and I was opening my visor every now and then to grab a quick look at the road ahead. Despite these conditions the dare-devilish locals were all up in high spirits wearing protective monkey caps and riding crazily horns blaring announcing the arrival of the kings. It was here that we encountered the next casualty of our ride. John Smith the brit gentleman was already struggling with his pillion and blinding rains and on one such left hander he scraped the side carrier of his bike and lost control. Crash, boom, bang he fell to the ground but managed to get up with some assistance. This was perhaps quite an injury as he was not able to straighten up for quite some time. Even at the ripe age of 60+ the very fact that he had undertaken such a ride with us was wonderful. His bike was taken over by our chief mechanic known as Mr SS, and we moved ahead towards the plains. Gravel on the wet road was making It more difficult for us to ride at speeds as now on curves we had to be extra careful not to end up in a slide. Luckily for us rains stopped and after grabbing a quick bite we were off again and getting into our first proper forest road. We were briefed at the Annaimalai Tiger reserve gate itself about the various risks posed by wild animals to people who halt and tease them. We hoped to spot some creatures as the roads were now becoming desolate and there were signboards at various places indicating elephant crossings and other notifications. The ride through the reserve was uneventful although we saw lots of indications of wildlife everywhere; I guess the sound of 20 RE bullets was enough to scare the living daylights of the wild animals, as it is they are rather elusive and shy creatures. We had a state border check post in the middle of the forest as we moved from Tamil Nadu back into Kerala and registered our names along with our bike details at the Chinnar wild life sanctuary check post. It’s a good thing that public vehicles are still allowed inside these reserves albeit with necessary notifications and with timing limitations. I presumed the roads were created first to connect places and dated quite long back and then the forest reserves were built around them under Project Tiger thus making this a protected place but with no alternate routes these connecting transportation arteries couldn’t be blocked. After getting out of Chinnar we started off by climbing another set of small hills and started seeing the – ‘oh so omnipresent’ – tea estates once again. Entering Munnar we found ourselves in the midst of some election campaign but managed to crawl our way through the busy semi urban traffic to our hotel. The first thing all of us did after checking in was to take off our wet riding gear and spread it out under the fan as we cooled off. When we woke up the next day Munnar was still pretty overcast buy the clouds had started floating away already. We packed out stuff and went to tank up. Tanking up was more or less a daily ritual whenever we covered more than 200 kms as the effective range of the Classic 500 was just about 200 – 250 kms. We started the day by checking the newspaper for any weather updates and asking people at our destination point whether more showers were expected. Luckily for us none whatsoever were predicted. The Smith couple joined us in the backup van as we had already transported their bike further ahead. By the time we reached the first regroup point at a restaurant called Crystal Kitchen the weather had changed into a hot sunny day and it was quite a change from the foggy moist rides we had been having so far. Weather gods had been playing hide n seek with us throughout this journey as we encountered diametrically opposite weather every now and then. A quick south Indian meal at crystal kitchen and we moved towards Athirapally waterfalls which were a major tourist attraction right in the middle of the Kerala Forests. After winding up from the waterfalls it was time for us to stop and take a quick group photograph when we arranged all the bikes against one of the seasonal waterfalls coming down a rocky edifice. The sight of the score odd bikes lined up did make many a passerby stop and click a snap or tow of this spectacle. After the group photograph we moved off again into the midst of the Parambikulam wildlife sanctuary and rode on almost desolate forest roads lined with tall trees on both sides and traversing an occasional old bridge made over the fast flowing rapids coming down from the Parambikulam reservoir. 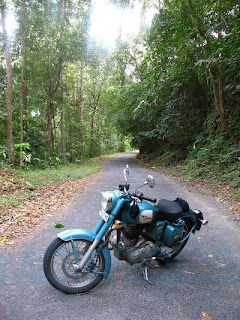 In the last stretch before Valparai, on a blind turn one of the bikers was startled by an oncoming bus and suffered a small skid, losing the bike’s headlight, but the bullet being built like a gun took almost all the brunt on itself and the rider did not suffer a scratch. We reached Valparai in the middle of a chilly and cloudy evening and quickly checked into the hotel and rushed out for a quick bite. Riding on these ranges definitely did make most of us rather hungry by the time the day’s ride ended. Valparai is often reckoned as a favourite haven for most holiday goers in this region purely because of its rustic touch and isolation from the rest of the world. This was proven to us the earlier night when none of the mobile phones could catch any range and there was no wireless internet connectivity anywhere. No wonder this place is still considered as one of the most disconnected heavens in South India, with shops closing in at 8 and the whole town just going off to sleep and switching off the lights by 9 pm. We woke up to a slightly moist morning and zoomed off downhill towards ooty again and then moved towards the tea estate hills again. The descent was an interesting one with numerous hairpin bends all the way making the ride so exciting. After crossing Kotagiri and Keel Kotagiri, or lesser Kotagiri we descended further into forest land and after a rather bad patch of non existent forest roads, reached the Anjanagiri tea estate. This tea estate is bang in the middle of a forest and offers amazing view and a small temple on a mountain to add. The stay at Anjanagiri was one of the most exhilarating parts of this adventure as we had the tastiest food served in perhaps the most inaccessible parts of the southern hills and we stayed in small warm n cosy tents out in the open. After the dinner and the campfire we spent the whole night listening to the sound of the cicadas with an odd shrill cry of an unknown bird or animal from the forest. The next day none of us wanted to leave Anjanagiri, as the Srinivasan family who had hosted us had treated us to the best food and the most awesome places where we felt so much at home and one with Mother Nature. But then as per schedule we had to move further and after bidding goodbyes to the tea estate manager Mr Sitaraman and the 2 beautiful German Shepard’s Simba and Shadow we rode our steeds over gravel, slush and finally out onto the highway and towards our next destination, Sultan Bathery. It was here that a small spelling or pronunciation mistake (gudlur v/s gundlurpeth) took me all around the Mudumalai forest range and through Bandipur forest and Wayanand making me cover an additional 80 odd kilometres through 3 different states finally reaching the re-group point at Sultan Bathery. After a lazy lunch and some rest we moved off towards Madikeri which traditionally belongs to the carnatic province of Coorg known for its warrior clans. After so much of tea tea and tea what now welcomed us was the sight of coffee plantations. These were very different from the tea estates we had been seeing till now and had huge trees with small bushes of coffee plants in between loaded with the coffee berries. We reached Madikeri at dusk and after settling down decided to venture out to busy some spices, coffee and other condiments. The next day we woke up to the sound of some awesome 2 strokers as the owner of the hotel in Madikeri where we were staying started his vintage Jawa motorcycles in the morning. We all stood there admiring the respective beauties we possessed and then were escorted out by him towards somwarpet, another rural marketplace small town in the coorg region. It was a little after somwarpet that we came across vast meadows which looked so tempting that we actually stopped at a place and took our bikes off the road on to the small hillock. There was just a single tree on the hillock and after roaming around on our bikes we all lined up for a nice group photograph atop this hillock. 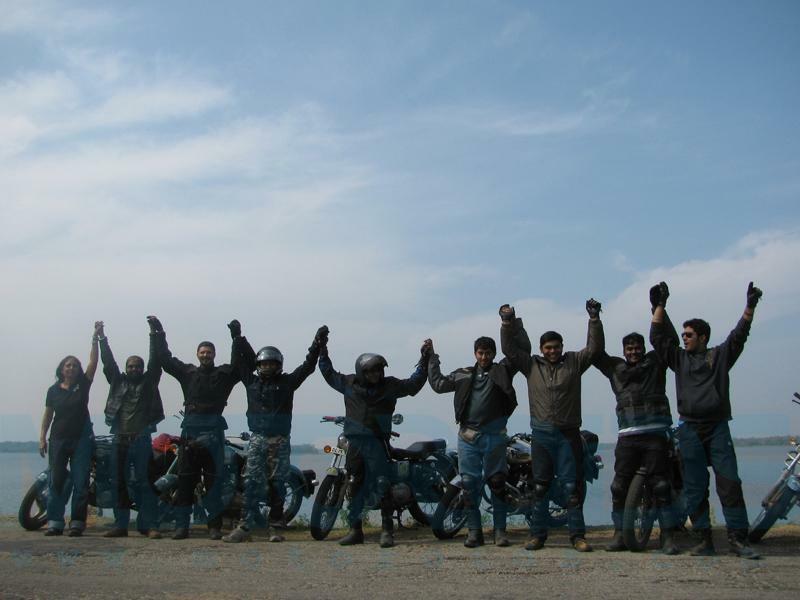 Once the well deserved break was over, we descended and zoomed off towards sakleshpur. Post lunch it was a pretty straight forward ride till Arehalli, the outskirt village and then came across more coffee plantations, finally leading us into Chikmaglur. After reaching Chikmaglur, some of us immediately got freshened up and rode towards the Taj for a party while most of us just unwound as it was the penultimate riding day. The last day definitely did make us all a little bit sad as we knew it was time to end this epic of a journey and luckily for us the final leg was hardly any distance too. We decided to stay off the highway so that we could catch a glimpse of the countryside we re riding through and come closer to the local environment. The rural roads also in this part of the country were good enough for a comfortable speed. Each village had a small village pond and a temple to adorn its boundary and it always provided us with the necessary landmarks to follow the trail. Taking the usual tea breaks at the roadside shacks we rode into Harenhalli, Mayassandra and Kunigal before we turned towards Bangalore and took one of the popularly used road stretches. It was here that we slowly encountered traffic, comprising of trucks, buses and an awesome number of other vehicles all going at different paces but with the sole intention of getting into our way. Or was it the other way, we were getting into their daily commute route? We reached the NICE (NECE actually) road in no time after lunch and then headed straight towards Banerghatta where the final end point of the southern odyssey was decided. As we hit the NICE road, 2 of our fastest riders just took off without even knowing where we had to turn off the toll road and get into maddening Bangalore city towards Banerghatta. We reached the end point which was a resort in this part of Bangalore and was a nice quiet place where we parked the bikes and celebrated the culmination of an awesome experience. After we had nearly settled down, the 2 adventurers who had zoomed ahead managed to understand their mistake and finally located the resort rolling in as the slowest and the last of the riders. We booed them sufficiently enough for them to turn pink with embarrassment of jumping the gun. That night we had a small party at the resort and a slideshow of the photographs taken by all the riders to showcase the unique experience we all had gone through taking 3 south Indian states on 2 wheels in one helluva ride – The Southern Odyssey. 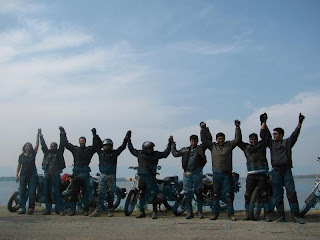 Although there were many riders coming from the media who joined up this adventure to experience the extravaganza that Royal Enfield had promised to take them on, only one (yours truly) actually stayed long enough to complete the entire adventure while the others just attempted specific legs of the same. This journey definitely taught me a lot about the Bullet, the Royal Enfield philosophy and most important, earned me some great friends too.